The LMC prices as of February 21, 2015. 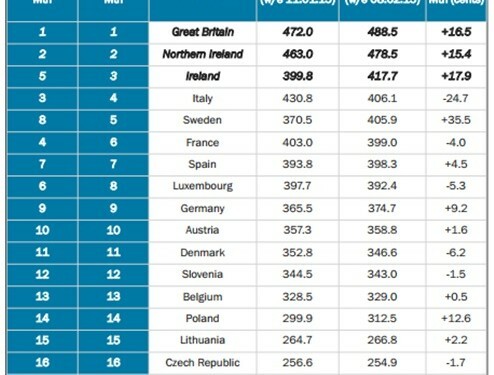 Ireland now ranks in third place for European beef prices according to the Livestock and Meat Commission (LMC) in Northern Ireland which cites latest European Commission figures. Ireland has seen steady growth in beef prices over the past several months. Last month Ireland ranked in fifth place. 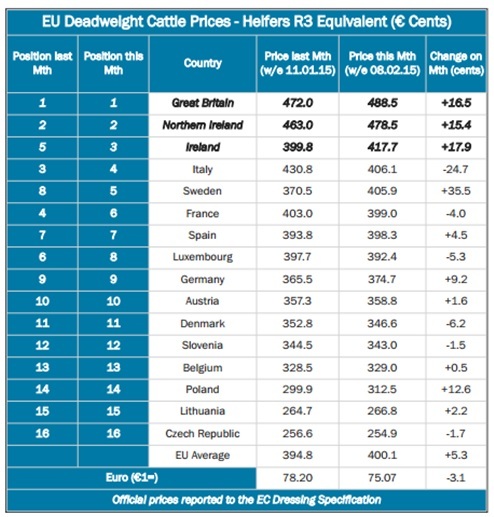 The LMC says that in recent weeks deadweight beef prices in Ireland have been improving steadily in euro terms with an R3 heifer price of 417.7c/kg in the week ending February 8, 2015. These latest LMC figures show an increase of 17.9c/kg from the four weeks previous when it was 399.8c/kg. The latest R3 heifer price in Republic in the week ending February, 8 2015 was 17.6c/kg higher than the EU average price or €56 on a 320kg carcase. The LMC says that while the R3 heifer price in Republic was higher than the EU average price it remains markedly behind the equivalent prices in Northern Ireland and Great Britain. In the same week ending, LMC figures show that the difference in R3 heifer prices between Ireland and the North was 60.8c/kg (the equivalent of €195 on a 320kg carcase). “The strengthening in the value of R3 grade heifers in the United Kingdom and Northern Ireland has been driven by a weakening of the euro against sterling,” the LMC says. The R3 heifer price in the UK in the week ending February, 8 2015 was the equivalent of 488.5c/kg, up 16.5c/kg from the previous month, the LMC found. Furthermore, the LMC says that this has widened the differential between R3 heifer prices in the UK and the EU; the equivalent of €283 on a 320kg carcase.